Day trips depart any time between 8 AM to 1 PM. Tandem kayaks are priced as canoes. Arrive 1/2 hr before departure time. Tubing–You need to arrive by 9:30, 10:30 or 11:30 AM. Trips can take from 3 to 5 hr depending on water levels. Remember shoes for river. Do make reservations, especially for weekends.We offer two sections of the Shenandoah for our tube trips. We decidethe day of the trip which section based on water levels. 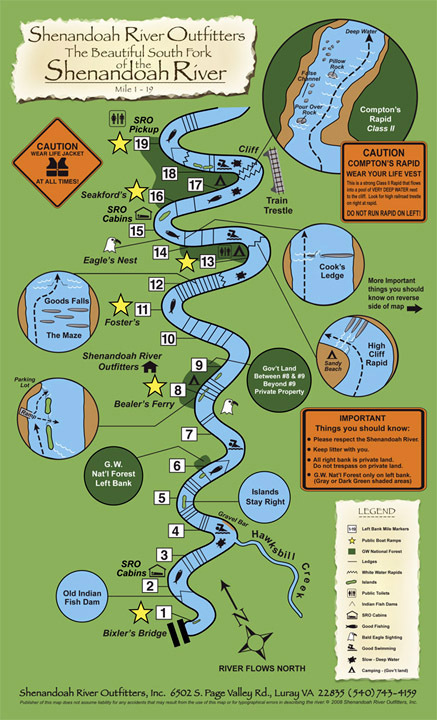 Raft trips can take 3 to 5 hours. Arrive between 9 AM and 1 PM. Do reserve as limited numbers. We have 4-man and 6-man rafts. Rafts are great for families with small children as young as 3. It’s EASY to sign up online for quick reservations–click here! If you have your own canoes and kayaks, we offer shuttle service. In one direction-on our side of the river-$30/canoe or kayak; both directions=$50/canoe or kayak. From the other side of the river-$50 to $70/canoe or kayak (min of 2) with 3 PM pickup only. Call first to make sure we can do the shuttles for the time/dates you want. Information Collection, Use, and Sharing –Shenandoah River Outfitters Inc and Shenandoah Canoe Company–(SRO & SCC)–are the sole owners of the information collected on this site. SRO & SCC only have access to/collect information that you voluntarily give us via email or other direct contact from you. We will not sell or rent this information to anyone. SRO & SCC will use your information to respond to you, regarding the reason you contacted us. SRO & SCC will not share your information with any third party outside of our organization, other than as necessary to fulfill your request, e.g. to charge an order. Your Access to and Control Over Information–You may opt out of any future contacts from us at any time. You can do the following at any time by contacting us via the email address or phone number given on our website: You can see what data we have about you, if any. Change/correct any data we have about you. Have us delete any data we have about you.Express any concern you have about our use of your data. Security–SRO & SCC take precautions to protect your information. When you submit sensitive information via the website, your information is protected both online and offline. Wherever we collect sensitive information (such as credit card data), that information is encrypted and transmitted to us in a secure way. You can verify this by looking for a closed lock icon at the bottom of your web browser, or looking for “https” at the beginning of the address of the web page. While we use encryption to protect sensitive information transmitted online, we also protect your information offline. Only employees who need the information to perform a specific job (for example, billing or customer service) are granted access to personally identifiable information. The computers/servers in which we store personally identifiable information are kept in a secure environment.